Like Eeyore, I’m awfully fond of Useful Pots – and boxes, and bags, and – well, anything that will hold red balloons or other Stuff. 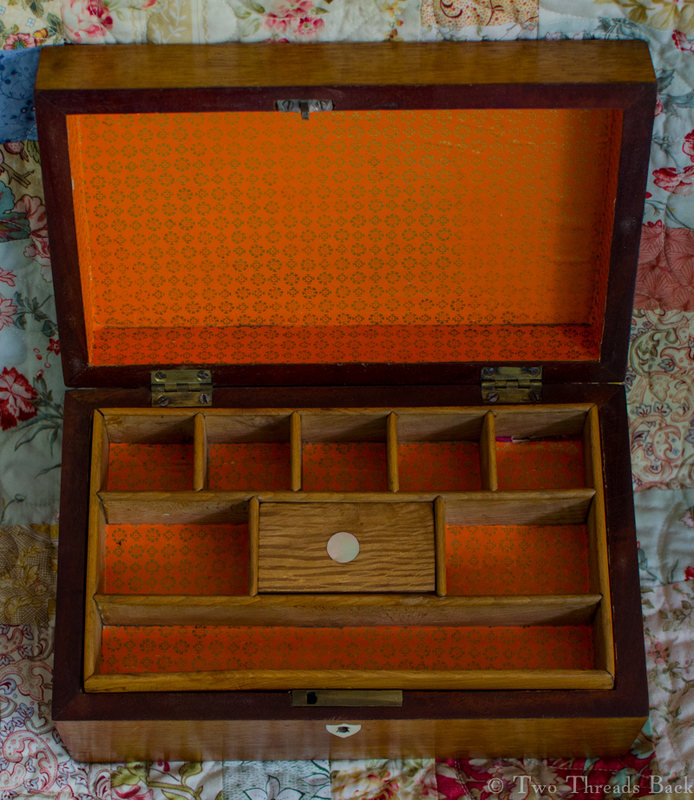 I found this pretty little box a long time ago, and even though it was missing any contents, the workmanship was neat and the condition was wonderful – and it had a key! My plan was to make period appropriate Stuff to go inside. Stuff I could actually use instead of conserve. And like all my projects, it’s taken a whooooole lot longer than I thought. It probably dates mid- to late 19th century, although I tend to think later. I don’t know if it was professionally made and sold, but it seems to have a hint of “home-made” about it. It’s smaller than average, but everything about it is sturdy, smooth, and fits together perfectly. There was no need to refinish or even re-paper it. You can see the clever way the center compartment was crafted. The wooden support slants down so that you press the lid on that end and the other pops up to be lifted! 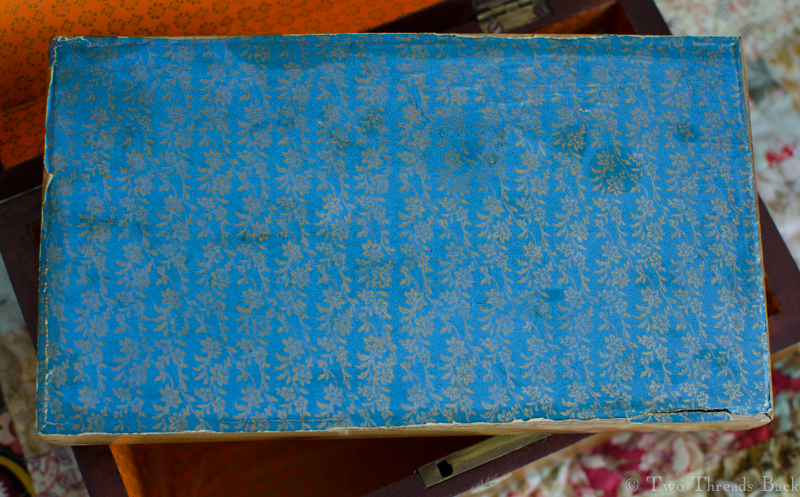 There are three kinds of paper lining: the orange you see above (which was a added in its youth), the blue on the underside of the tray, and traces of an original gold-stamped pattern in deep pink, just peeking out from under the orange in places, all typical of the era. 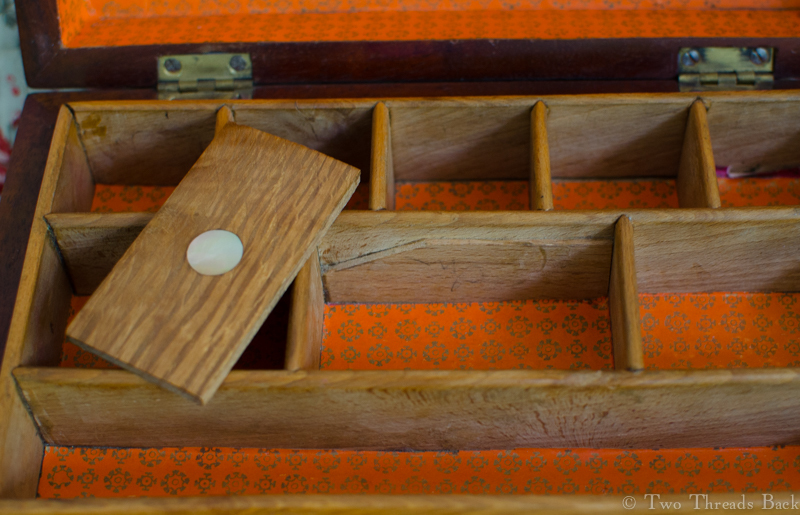 The underside of the tray. It doesn’t look as shabby in person. Really. What went in a workbox? It seems pretty obvious, but I like Useful Lists as well as boxes. The Workwoman’s Guide, c1840, devotes a paragraph to the subject. 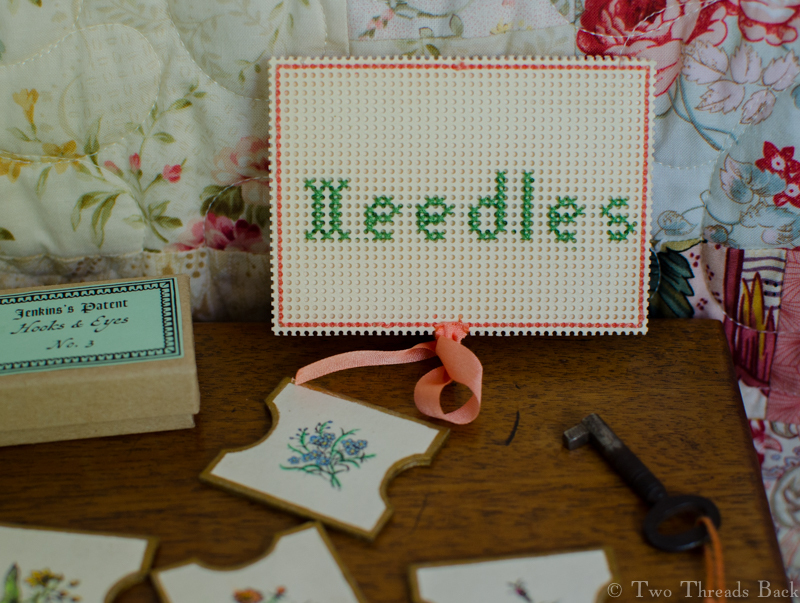 The materials employed in the construction of articles, which come under the denomination of plain needlework, are so various, that a mere list of them would occupy more than half our space; and they are so well known, that no necessity exists for naming them in detail. [She then proceeds to do so.] 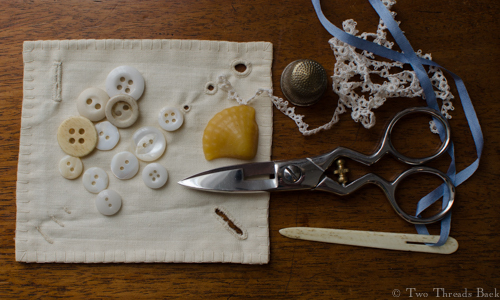 We shall therefore proceed, at once, to give plain directions, by which any lady may soon become expert in this necessary department of household uses, merely observing, that a neat work-box, well supplied with all the implements required – including knife, scissors (of at least three sizes) needles and pins in sufficient variety, bodkins, thimbles, thread and cotton, bobbins, marking silks, black lead pencils, india rubber, &c., should be provided, and be furnished with a lock and key, to prevent the contents being thrown into confusion by children [mea culpa], servants [don’t I wish], or unauthorized intruders [like a cat?]. While the inventor’s genius was flaring within me, I decided to patent some hooks and eyes as well. A little research turned up Mary Jenkins, a widow, who actually DID patent her superior hooks and eyes in the 1840s. (Wouldn’t you love to know her story?) 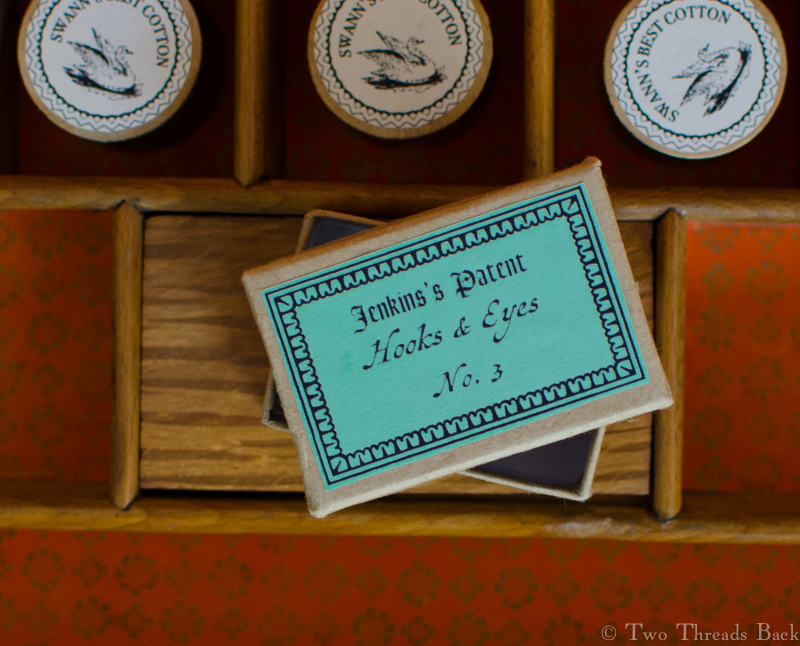 I have an antique box of hooks and eyes with no “brand,” so I just added her name to make my own version. A salute to female ingenuity! Now what about female persistence in the face of adversity? Idiot that I am, I also wanted some silk winders. 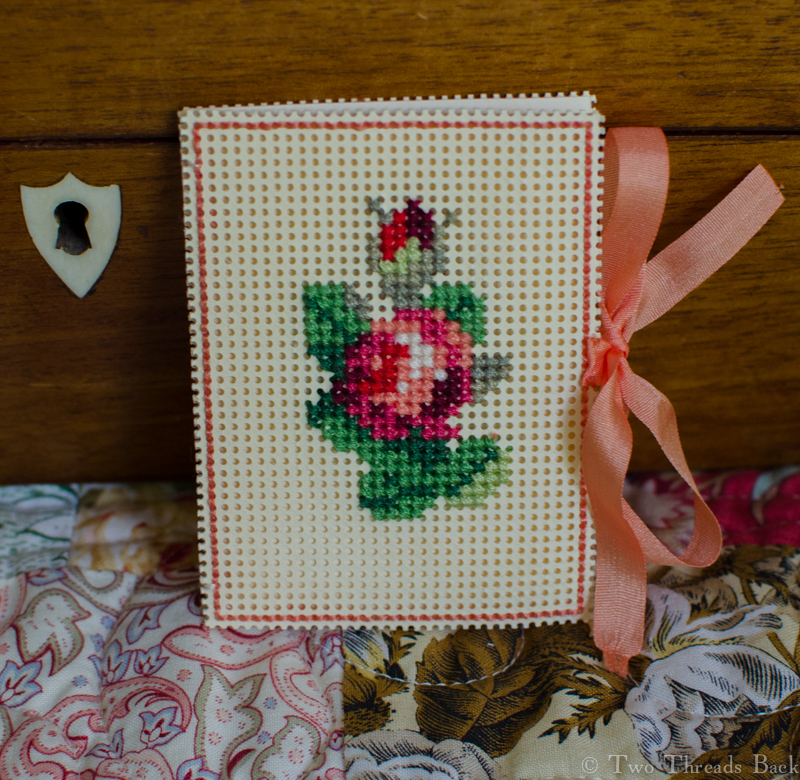 A “homemade Victorian craft look” was what I was aiming for, not easy when you have no talent for art. I drew a pattern and my helpful husband cut them out of matboard for me. 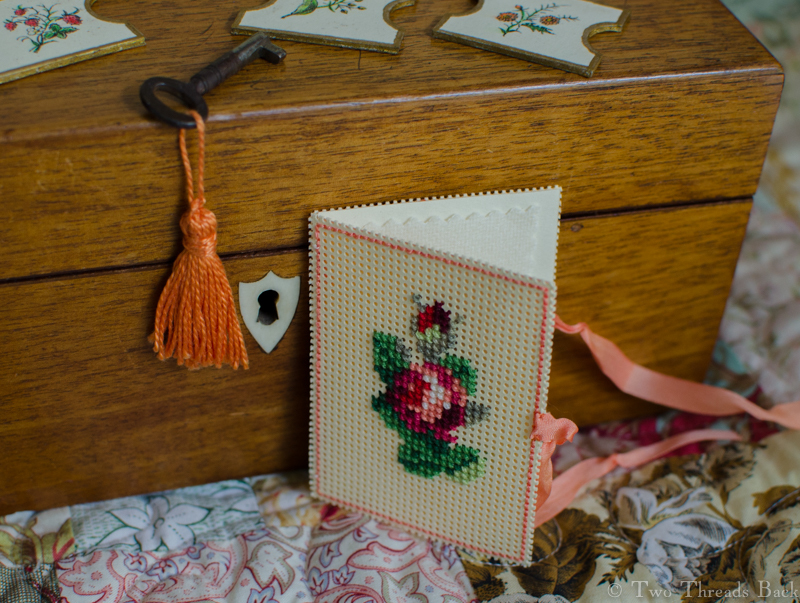 An 1840s French needlework magazine supplied the floral graphics which I scanned and tidied up. I added them to the winders and watercolored the flowers. Yes, I can color pictures! So far, so good. But then I thought they needed gold edges – mistake! It took forever to paint them all on, both sides, straight, and I will never try that again. 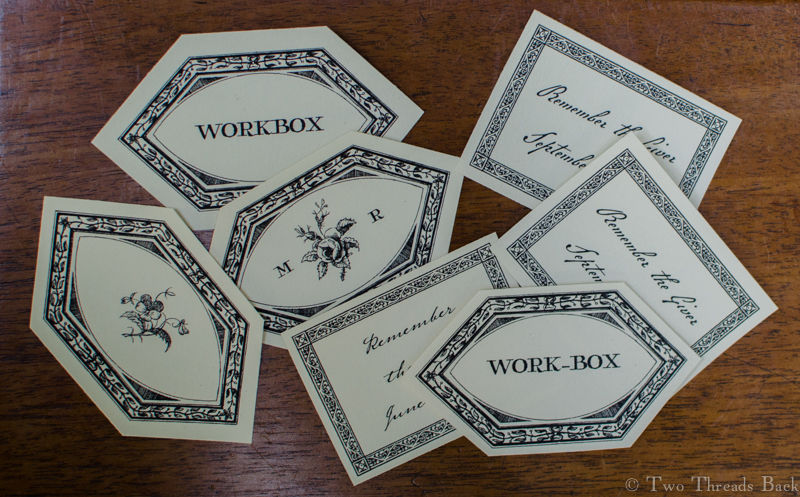 No self-respecting workbox could be useful without a needlebook. Punched paper was all the rage mid to late century, and I thought that would suit the style of the box better than something fancier in silk. 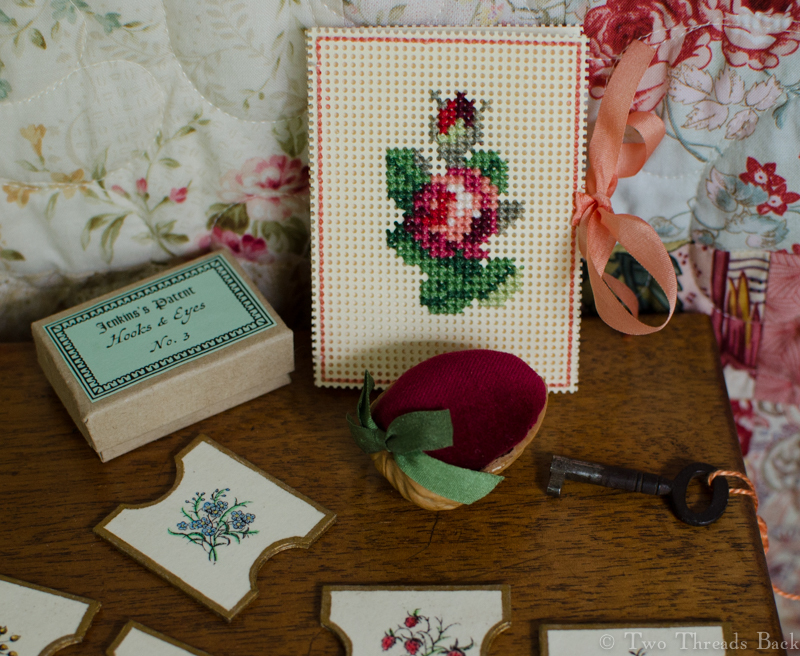 The floral pattern is from the Antique Pattern Library. 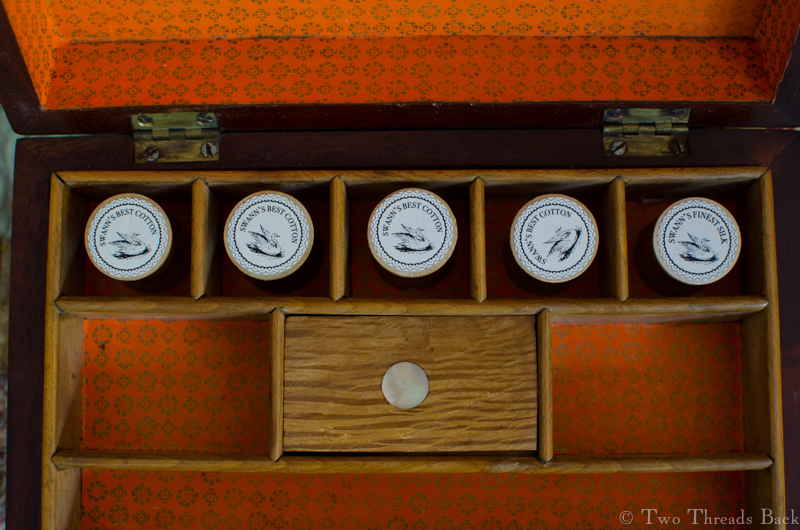 The interior has wool flannel for holding needles, and the letters are from a Victorian marking pattern. Ok, the letters weren’t much different, but it allowed me the illusion of historicity! One more project was on my list. 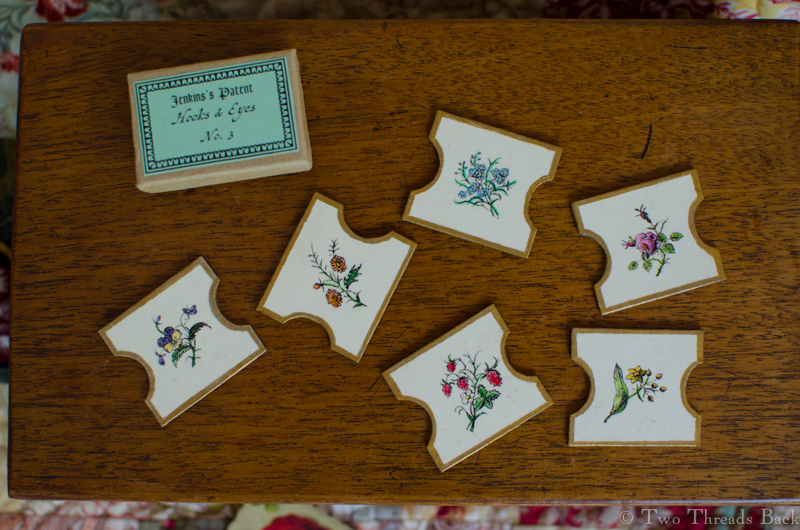 I love the little walnut sewing trinkets that were popular, from fancy etuis to those made-at-home with scraps – which now sell for a small fortune as primitives! So I took a half shell and stuffed it with velvet covered wool, and then trimmed it with a green silk ribbon to complement the other colors. It kind of looks like I’ve turned a walnut into a strawberry disguised as a pincushion. Maybe I was hungry at the time. A tassel for the key helps keep track of it. I’m also playing with the idea of a (removeable) label for the top and/or a card tucked inside. 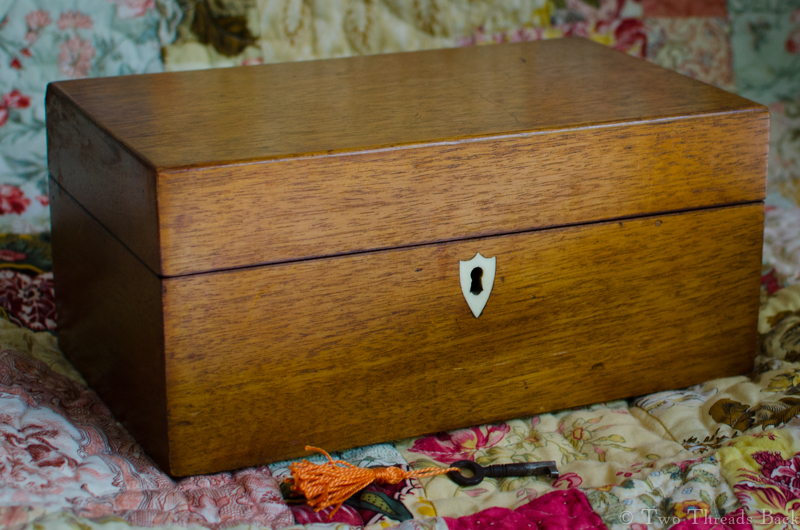 I’ve seen an antique with “Work-Box” on the lid which really caught my fancy but was out of my budget. The graphics I experimented with above are all authentic designs (Ackermann’s Repository, etc.). But I may not bother, since I’m debating taking it to the next heritage festival with a FOR SALE sign. This one took me so long that now I’ve got another box waiting its turn at rehab and I’m running out of room! 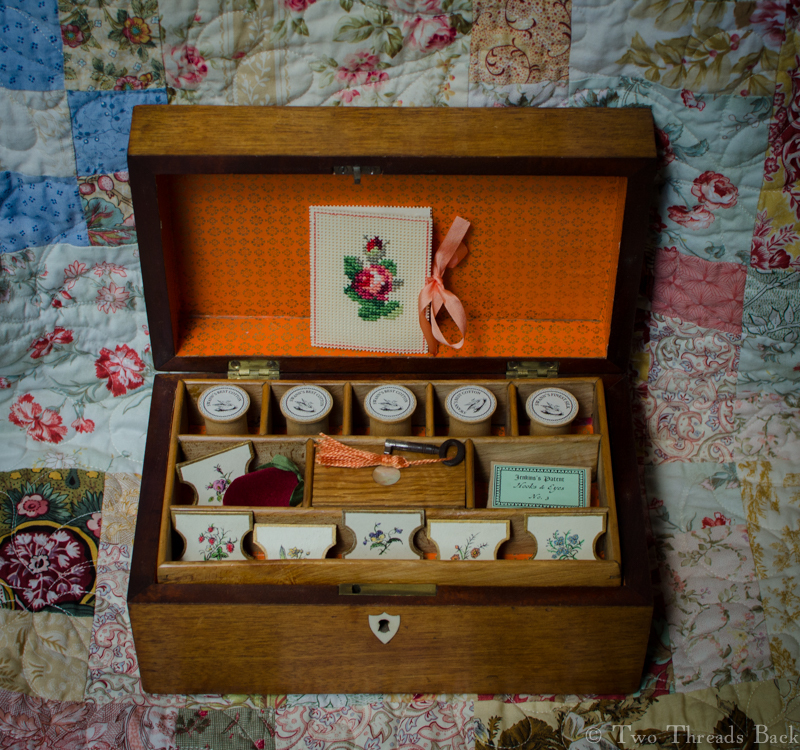 In the meantime, all the buttons, wax, scissors, bodkins and other requisites for lady’s work can stay tidy in a Useful Box.